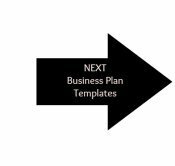 Your small business plan template is a great way to walk through the planning steps and determine the resources needed to create your successful business.
. . . This specific plan is a good option for small and/or home-based businesses who are not requesting financing, do not have extensive expenses, and/or are not pursuing a complex patent. 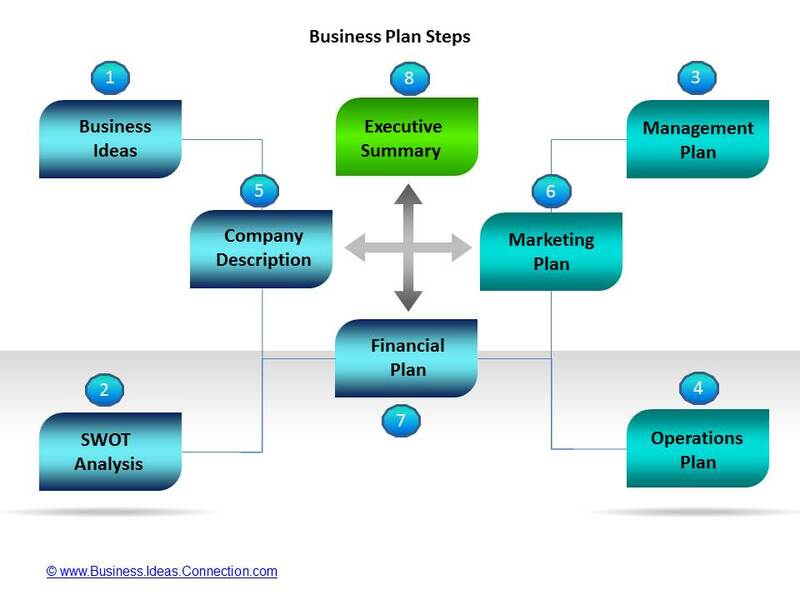 Some of those business types definitely require a much more robust business plan. As you plan for your small business, it is natural to want to focus in on "how much money do I need to get started?" While money is certainly important, there are several other resources to consider. 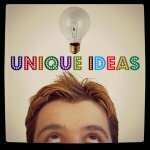 Some of the resources you may already have because you are already enthusiastic about your business idea and you want to invest the time, energy, and experience growing your business. What Resources Do I Have; What Do I Need? As we work through the small business plan template, the next section we want to work on is identifying the specific resources we both have available and those needed to help our business be successful. or keep it operating through the year?" The answers to this question will provide you with some direction in either starting your business or keeping your young business on the right track. We'll discuss the resources section in reverse order since the answers to the various sections lead us to conclusions and the ability to answer the all important funding question. As I've stated previously, I always leave the financial/funding portion of the business plan towards the very end of my planning process. This gives me the opportunity to fully organize my thoughts about what is really required throughout each section, figure out the costs involved, and then calculate the funds needed once I've thought through every aspect of my business. 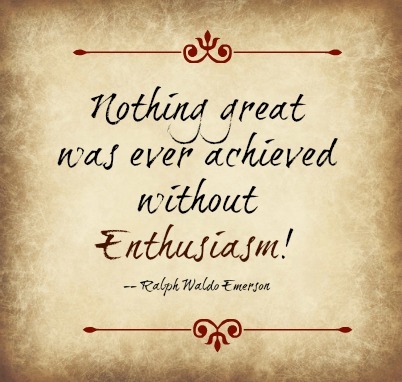 Training is such an important asset for any business owner! One area of an effective small business plan template you'll want to explore is "What training do I need to get my business started or move it to the next phase?" Your training needs may be in learning a specific skill, such as massage skills or dog grooming skills. In this case, you'll want to identify a school where they teach you how to groom an animal, what types of tools you'll need to provide this service, and allow you some "hands-on" time doing the specific tasks. In addition, there may be certifications and/or licenses required in order to do this type of business. Determine whether you can obtain these certifications through your training source or whether you'll be required to pass an exam through a regulatory agency before you can open your business. Make sure your training will appropriately satisfy specific education requirements to obtain these certifications or licenses.
. . . Another type of training which could be helpful is learning basic business skills to ensure you understand how to operate your business on a day-to-day basis. It can be very common for new entrepreneurs to have a terrific skill, their customers want their products/services, but the new owner doesn't understand how to operate a business. Of course, training may be formal through a community college, university (both online or attending campus classes), or online courses from a specialty school. It may be as simple as volunteering for an organization to get experience or working with a mentor in an ongoing business to learn specific skills from someone who is already successful in your field. As I plan my resource section on the small business plan template, I take a look at the equipment and products I'll need for my business. For example, does your business require a computer/tablet/smartphone? Other office equipment or software? Specialty tools? If so, what do you currently have -- write it down under the Resources Available section. Now, what products or equipment do you still need? Maybe you need a payment system (e.g The Square) which allows you to accept credit card payments? Do you have an accounting system so you can keep track of your business expenses and report appropriately at the end of the year? Or do you need to purchase inventory to have on hand for your customers? If so, how much? Can you get your products quick enough you won't need any inventory and can order and provide in a reasonable amount of time to your customers? If you are in the process of personally designing a product to solve a problem for your customers, you may want to contact a patent attorney for legal advice. Keep in mind a small business plan template may not be the correct tool for planning the patenting process and design roll-out. This is generally a much more time consuming process -- you may be able to use this format initially to get started and then move to another format as you plan for your business. In many cases, you may already be involved (in some capacity) with the industry where you're wanting to start your business. In this case, there's a good chance you already have some of the specialty equipment required to start your business. Some small businesses, such as online business ideas, allow you to start your business with the tool you are on right now, your computer!!! You may already own a vehicle, like a truck or trailer, which will support your new mobile or service business idea. Write down the resources you already have on your small business plan template.
. . . Or maybe you can find a used piece of equipment to minimize your start-up costs. One of my good friends purchased a used van for his carpet cleaning business when he started -- this was a terrific way to get him into the business with relatively low start-up costs. A new van could have cost him $20,000+ more to get his business started than what he paid initially! That's a huge savings for a small business. From my experience, I find it's easier to start small and not buy all the bells and whistles up-front. 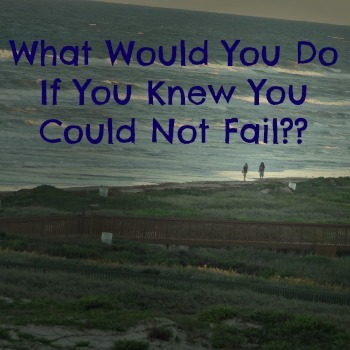 This was a lesson I had to learn -- I always wanted to 'buy everything possible' prior to getting started! One of my first businesses, I got caught up in buying every office supply I could think of to 'get organized'. Only to find out later, much of what I purchased was not necessary and I did not use. Be careful not to get caught in this trap -- sometimes the "fun things" are not always the "necessary items" to purchase for a business. Accounting software, for example, is not usually fun to buy. But it may be a necessity for your business if you plan to handle your own accounting. Also, as you begin your 'trial' marketing' program, use that time to determine what additional resources you'll really need to meet your business requirements. Go back to your small business plan template and adjust as you learn more about your business and the resources that will be helpful to grow your business. Finally, I get to the funding required to support my business idea. 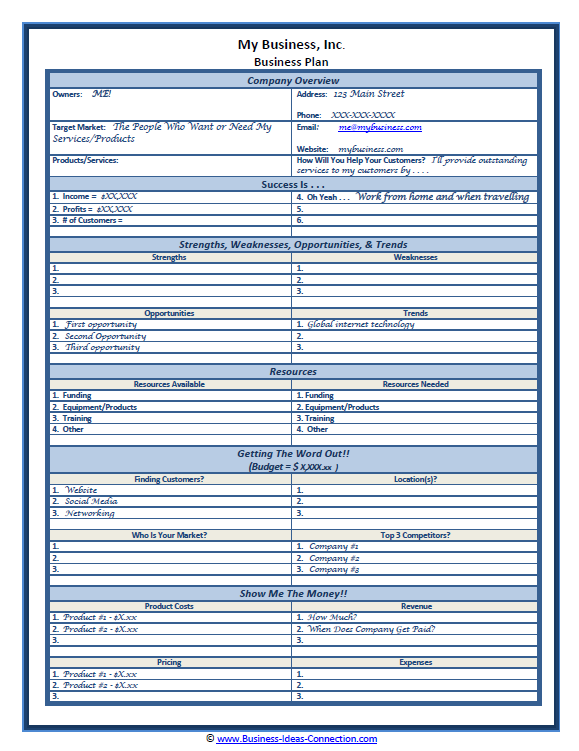 This is one of the most critical portions of the small business plan template. Again, many times I'll even postpone this last portion until after I've done my Marketing and Financial sections of the worksheet since many of your costs will come from these two areas. You can go ahead and jump to those sections now . . .
After I've completed those sections, I come back to this section. This is where the "rubber meets the road" in deciding what funds will be required to start or implement your business plan. Capture the total in the funding section. And how much money do you need to live on while the business gets started? Or do you plan to continue working your job and build your business part-time? 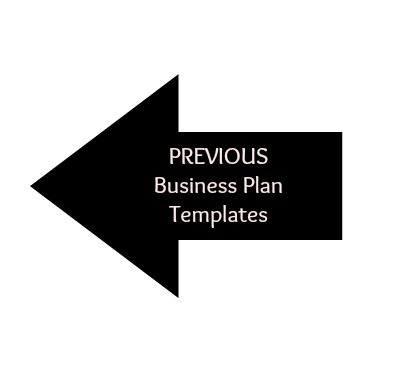 One thing to keep in mind, is the resources section of the small business plan template is very dynamic and has a lot of moving parts to it.
. . . So don't get discouraged if you are updating this section often. That's what it's for and what you should be doing!! 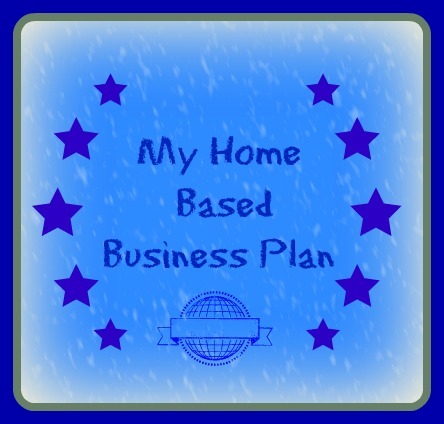 Your business plan is a WORKING DOCUMENT -- it isn't a document to do and put in the drawer! LOL! Use it! Cross it out! 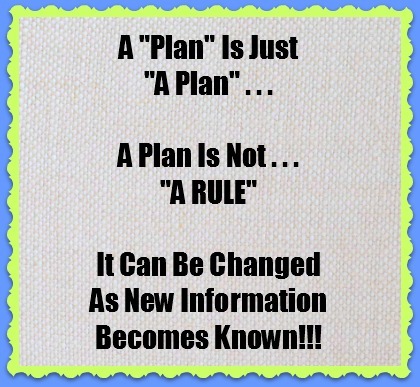 Add information as it becomes know! Delete information that appears to be obsolete! Etc. This is effective use of your business plan . . .